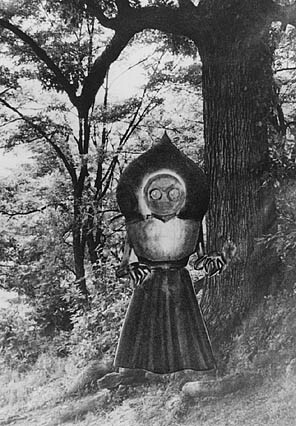 The "FLATWOODS MONSTER" was featured on the hugely popular TV Show WE THE PEOPLE 65 years ago... What was up with that? It got weird. 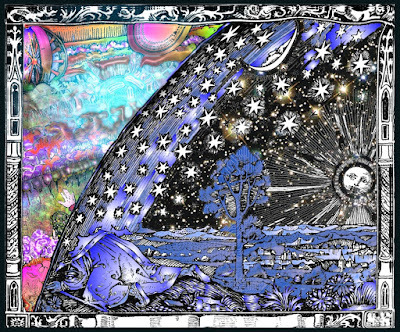 Given Current events, ufologically, it's rooted to an existential and corporeal admission of sorts... including official ones... we must call it disclosure... as to some lack of sentient and self-aware singularity in our dancer's arm of the Milky Way... We are not alone. We are not alone. Good News! The red pill beats the blue pill every time! 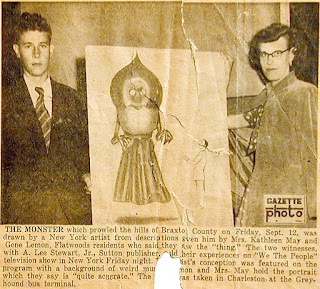 On Thursday, September 18, 1952, "Flatwoods Monster" witnesses Kathleen May and Eugene Lemon were accompanied to New York City by Braxton Democrat newspaperman, A. Lee Stewart, Jr. They'd been asked to appear on the very highly popular television talk show of the time, We The People. The far-reaching Flatwoods Monster incident, which Stewart had broken to the news media, had piqued the interest of NBC television executives, one can understand... it status was entirely viral for that day and age. They wanted the Braxton County residents on their golden era television program highlighting the interesting true to life. This abundantly filled their bill. The Braxton County trio was flown to New York late Thursday afternoon to stay at the Belmont Hotel... scheduled to appear on the show the following night, September 19, 1952. On Friday afternoon, May, Lemon, and Stewart were driven to the TV studio. They were greeted there by the host of the show, Mr. Daniel Seymour. 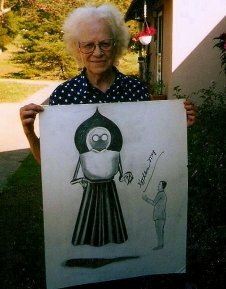 Off the set, the "Flatwoods Monster" witnesses explained the "Flatwoods Monster" encounter to Seymour. A sketch artist sat nearby and drew an off-hand sketch of the "Creature." as they spoke. Here was a primary distortion in the making. May and Lemon explained some of the details to the sketch artist. He'd questioned them as he continued to sketch the figure during the cold-read interview. After the illustration was finished, the large drawing was handed off to a crew member to be used for the opening of the live TV broadcast. Mr. Seymour then finished talking with May, Lemon, and Stewart off camera. The crew prepped them all for their imminent interviews. Cue the music, folks! Mr. Seymour charismatically strode out onto the set and took his place at center stage. The three Braxton County residents took their seats, set to begin their presentation. The live show began moments later when the camera focused on the master of ceremonies, Mr. Daniel Seymour. There was an eerie silence in the studio and the broadcast went live. "Imagine a scene in the autumn dusk, in a lonely secluded spot, which you reach right after viewing a fiery meteor in the sky. This was easy to imagine. THIS WAS NOT SO EASY." Suddenly, another camera cuts to the big drawing of the freshly drawn "monster"! It pounces on the screens of unsuspecting American viewers Nationwide! The orchestra music turns unsettlingly eerie and crescendoes to a feverish pitch! 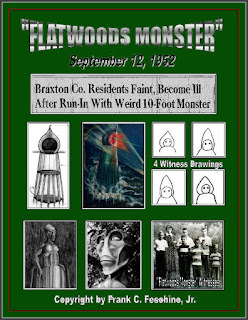 At that moment, history was made as a shocked American public gasped at the sight of the "Braxton County Monster" on their nascent television sets for the first time! Too bad that wasn't the monster. 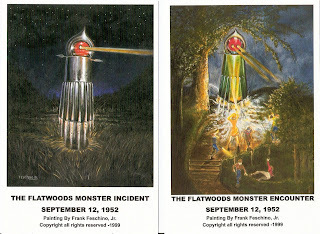 Verily reader, the illustration of the "Flatwoods Monster" was "a lie telling a truth," but real tragedy on further investigation... enduring cheap-shots for the effect even in the beginning! Chief among these tragedies are regretted memories of the unreturned and long forgotten fighter pilots lost engaging those UFOs..., through the wounded pride and sensibilities of the betrayed persons involved with the Flatwoods event, moving on to the ongoing disgrace of a media continuing to misinform us today! Such remains to be addressed. See, the realistic portrayal of the Flatwoods figure was correctly described to Frank Feschino, Jr. by Mrs. May during his countless interviews with her and was also described to reporter Stewart, as well, by May; it was as a hovering mechanical device! It was not a "Monster" wearing a dress. Mrs. May: "They just told me they'd like to draw a sketch of it, and Gene and I together had told him what we'd seen, and he [artist] drew the sketch." Feschino: "Why did he draw arms on it then, because you told me it had antennae? Mrs. May: "I told him that, too! But that's what he drew on it. To make it look more like a 'monster' I guess." 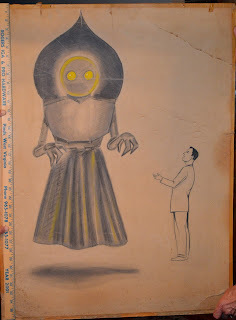 This malfeasance of the media led to the incorrect, albeit enduring, portrayal of the mechanical figure as dress-wearing pixie... and the dismissable folklore of the "Flatwoods Monster" was born! But wait, reader! There's more, much more. Devils in details. 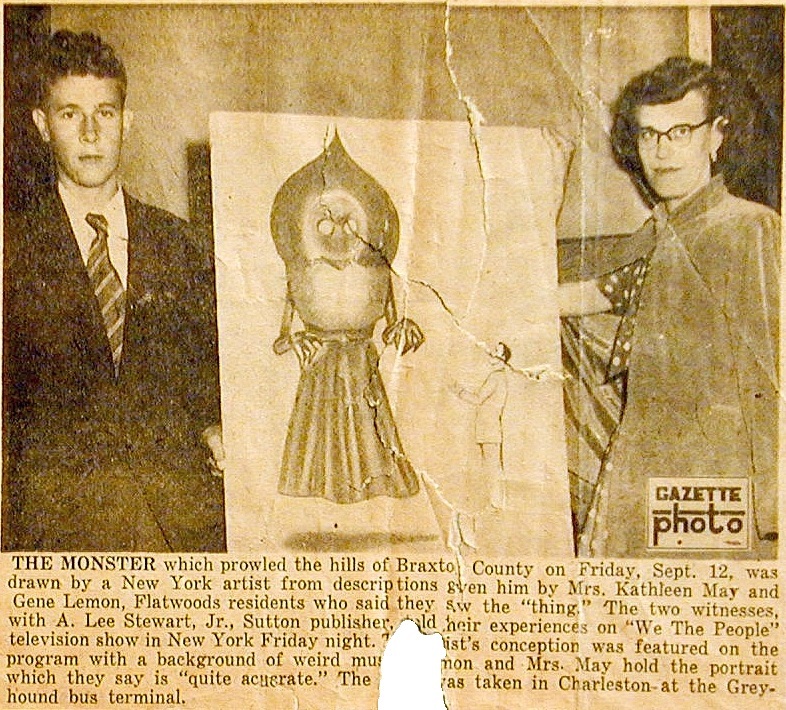 On Monday, September 15, 1952, and, as pointed out above, and preceding the We the People interview (so We The People should have known), The Charleston Gazette newspaper posted an article containing key information about the accurate description of the so-called "monster." 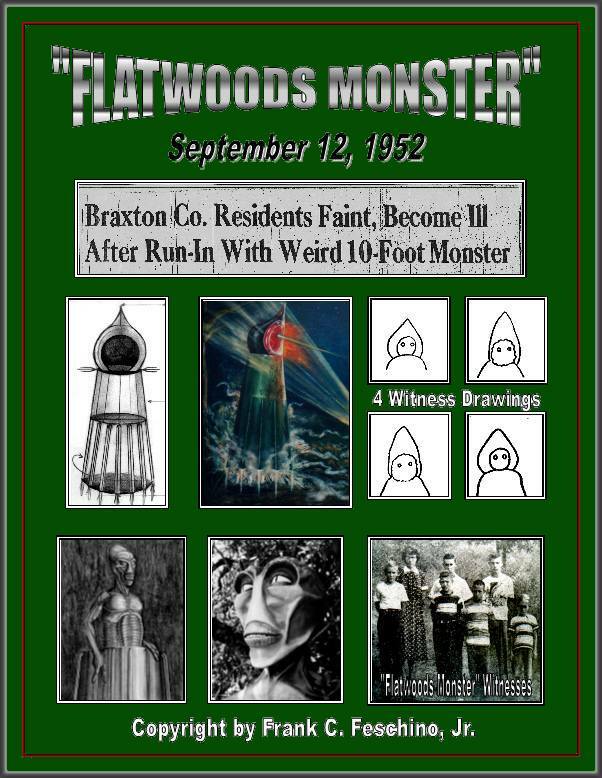 This information was actually obtained by A. Lee Stewart, Jr. during his interviews with the witnesses back in Flatwoods, immediately after the encounter happened. You see, Stewart was at the May home shortly after the encounter, led a posse of armed men onto the farm where the encounter occurred to chase "a monster," talked to the witnesses all that night in a third degree, and then later interviewed them in the days ahead. This was big stuff taken seriously. The newspaper article of evidence explained, "Braxton Monster Left Skid Tracks Where He Landed—(Special to The Gazette)," actually precedes the incorrect portrayal of the TV show "Monster" drawing... by five days! Yes reader, five days! The witnesses gave the actual description regarding the "monster," at the start! The staff of the We the People program really can't claim an ignorance when it was this initial report crossing their interest threshold, initially, in the first place! It "Wore a suit of green armor. Looked like a mechanical man. It had a blood-red face. It sported a black, spade-like cowl which extended a foot or more above its head." Yes, reporter Stewart got it right in his initial reportage. Five days later in New York, Kathleen May was trying to describe the pipes to the artist and likened them to the rolling pleats of drapes! The artist drew... drapes. C'mon! Given the artist must have been provided Stewart's report... the artist could have just phoned that in on can and wire! Eyewitness Freddie May told Feschino, "What Mother described as the pleats of hanging drapes, were actually tubes running vertically." "It was just kind of floating. It was about a foot to a foot and a half off the ground." 1952 was a Summer of Saucers followed by Presidential orders to the military to shoot those UFOs down. Full stop. Should we be surprised that one was shot down on the old Fisher farm, with others in a very turbulent West Virgina, right about now 65 years ago? Credulity is stunned by implication. Something else, too. We the people was a hugely successful program and sold a lot of "soap." There would be just one more program after Flatwoods and then it went inexplicably out like a candle. Make of that what you will. 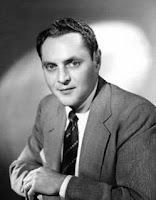 The format of the We the People show, which was first telecast on June 1, 1948, was to interview various guests about important events occurring in their lives. Ordinary people, celebrities, entertainers, and politicians alike were informally interviewed by the host, who would casually chat with them on the set. This informal talk show format made We the People one of the most popular TV shows of its time. At the beginning of each segment, the guests were introduced with the opening line, "We, the People...speak." 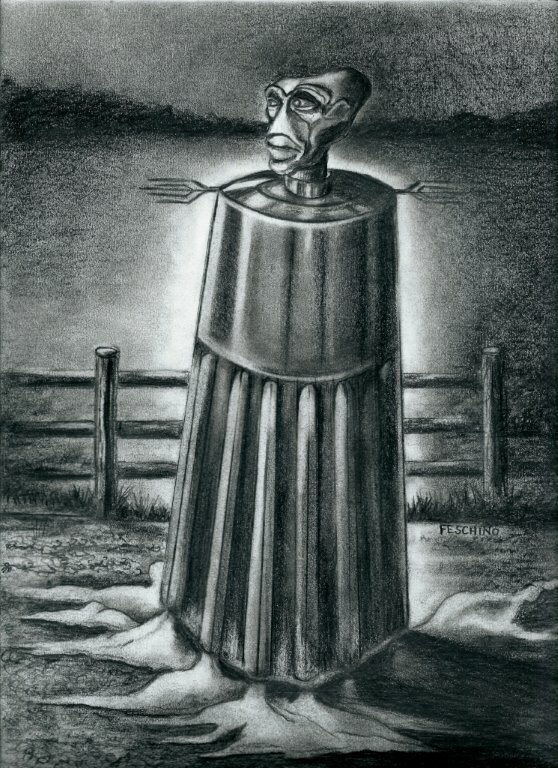 Yet, after airing the "Flatwoods Monster" story on September 19, 1952, this popular show was summarily and inexplicably canceled after the telecast of only one more program. Highly strange, on September 26, 1952, the show made its final appearance on NBC TV. "This could get out of hand," I told Chop. Why doesn't the Air Force squelch it?" "We've already said the object was a meteor," he retorted. "It'll die out," Chop insisted. "But people will remember it if something breaks." Donald Keyhoe then goes on to say, "The Air Force hands-off attitude seemed peculiar to me. For the monster story was having a serious effect, in addition to letters from worried Americans." 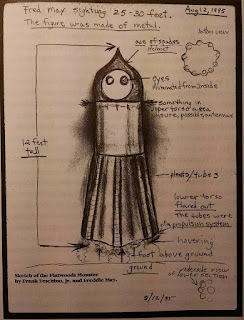 Was the frightening nationwide telecast of the "Flatwoods Monster" segment on September 19, 1952, the reason that the plug was pulled on We the People, reader? 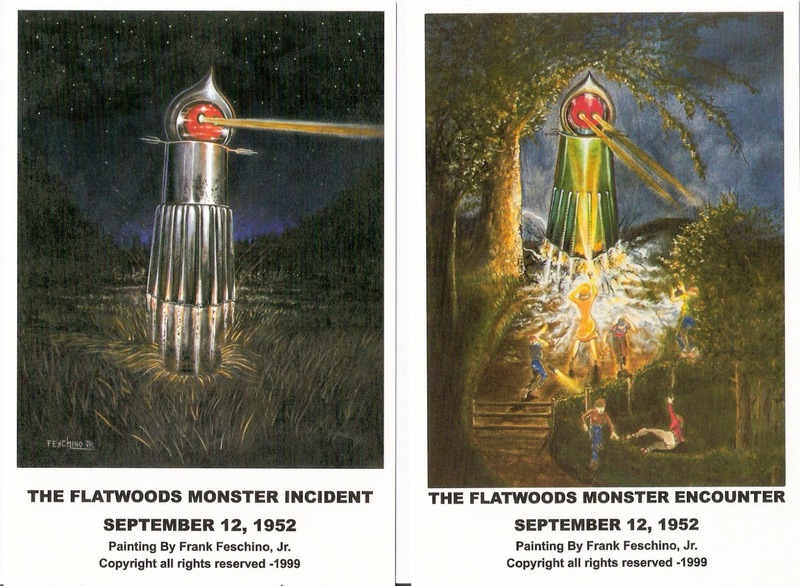 Well, here we are 63 years later, and still learning about the "Flatwoods Monster" incident. Perhaps more truth looms in the upcoming future. I'll stay tuned. Listen for me! I may go out. Dear Al, As you know, I've followed your study of this incident for many years, and learned a lot. The encounter was closer than the one I personally experienced. Having only seen a flying saucer once --as you know, with a witness-- I am understandably eager to learn more. From testimonials I've heard, we've heard, over the years I'm convinced there's something very important to be learned. Please keep researching and, above all, keep writing. --Your fellow EG alumnus, Geo. Done and done, Sir! Thank you for your kind attention!